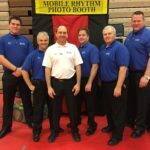 Mobile Rhythm Entertainment is a member of the School Dance Network. How are the DO NOT PLAY songs determined? We have selected a review panel that represents a cross-section of unbiased reviewers who represent school faculty members, administration, students, parents and responsible DJs. The individual members of the panel remain anonymous and may change periodically. We have worked to find moderate panel members that are neither extremely conservative or liberal in hopes of having a good cross section that represents the morals of most Americans in cities from coast to coast. We supply them with new songs as they are released and take a consensus of their opinions, whether or not a song is appropriate for play at school dances. The school dance administrator should always make the final determination about a DJ’s qualifications and their adherence to individual school policy. The DJs in our “Responsible DJ Directory” have agreed to our member code and have displayed their desire to uphold our standards. Our DJs have chosen to identify themselves as caring, and responsible DJs who are anxious to present a clean and safe DJ show designed for minors in a school dance setting. It’s a great way to start your search for a trust-worthy DJ service with Mobile Rhythm Entertainment. What if disagree with the choices in the TOP 30 Safe Songs list? First, make sure you are listening to the “edited version” of the song in question. Many songs today have inappropriate language in the original version but the version that ends up on the radio and should be played at schools has been edited for foul language. Sometimes, though the songs have a message or content that you still take exception to. Some communities are more conservative than others, and there may be innuendo or lyrical themes that your staff feels is inappropriate. Like with any reviewing process there may be judgement calls that you are not comfortable with. Certainly every school should take responsibility for the final decision on any song. We encourage you to contact us directly for songs you find are inappropriate. If we find that there is enough widespread disagreement with a song on our list we will definitely reconsider it for our “approved list”. Who does the “clean edits”? There are several music services available to DJs that provide clean edits. I would suggest that you ask your DJ if they subscribe to a reputable music service (Prime Cuts, Promo Only, RPM etc) that provide edited versions. If they edit their own music, or they use I-Tunes (clean versions) I would be suspect. “I-Tunes clean” is usually not clean enough, and self editing is many times not predictably accurate. Avoid any DJ that says they just drop the volume or cut the audio on the fly as they play the song. It leaves way too much room for error.